The SARE Advisory Committee uses the Georgia SARE LOGIC model objectives to help direct their activities each year in the following six established priority areas: compost, organic production, grazing-based animal production systems, direct marketing, conservation tillage systems, and local food systems. Each year, the Committee hosts trainings, workshops, offers travel scholarships and distributes educational materials to meet their objectives regarding the six priorities. This year, we awarded scholarships to county Extension agents and farmers to attend the following conferences or workshops: Georgia Farm to School Summit, Southern Sustainable Agriculture Working Group Conference, Georgia Organics Conference, and the national SARE Our Farms Our Future Conference. All of these conferences increased knowledge and confidence among participating agriculture professionals which then translates to an increased ability to assist organic farmers, resource limited, and small farmers. The Georgia Model State Program developed a LOGIC Model to guide our training efforts. The LOGIC Model, updated in 2015, reflects the current needs of Georgia as directed by the SARE Advisory Committee. To reach our long-term goal of “Increased use of sustainable agriculture practices by producers at multiple scales supported by a knowledgeable network of agricultural professionals ensuring a high proportion of diverse, profitable, and environmentally-friendly farm operations”, we identified the following six areas for training workshops: conservation tillage systems, organic production, grazing-based animal production systems, composting, direct marketing, and local food systems. In 2016, the SARE Advisory Committee decided that due to difficulties in identifying data that could be used as metrics for mid- and long-term goals in the Logic Model, the Model State Program funding would be better utilized for trainings and travel scholarships for agents and farmers in the state. We continue to gather good information on knowledge gains, behavior changes and how the trainings influence county programming among participants as a result of attending the SARE sponsored trainings and events. Each year, the Advisory Committee identifies trainings and events that will address one or more of the six priority areas. For the 2017 – 2018 cycle, these included travel support for Extension agents to attend the Georgia Organics Conference, travel support for an Extension agent to attend the Georgia Farm to School Summit, travel support for Extension agents to attend the Southern Sustainable Agriculture Working Group Conference, support for hosting an In-Service Organic Production Workshop for Extension agents, support for hosting an In-Service Organic Certification Workshop for Extension agents, and support for running three Cover Crop Workshops and Field Days for farmers and Extension agents. All of these activities increase knowledge and confidence in participating agriculture professionals which then translates to an increased ability to assist organic farmers, resource limited, and small farmers. The 2017-2018 cycle built on our previous work with local food systems by participating for the first time in the Farm to School Summit. Our sponsorship of this Summit allowed for the development of a farmer’s track at the conference for the first time, which fostered discussions between farmers and school nutrition directors on barriers and opportunities to collaborating with one another in the State. It also helped train county agents to better facilitate some of these programs and relationships within their counties. We also ran a successful In-Service training for Extension agents regarding organic production, which gave agents a thorough and hands-on learning experience. The idea behind hosting In-Service trainings is based on data showing that agents are more likely to ask more questions during trainings when there are only Extension agents present, and are less likely to reveal their uncertainties if trainings also include producers. We have also been building on our work with conservation tillage systems by focusing more on the use of cover crops as being a critical practice for building soil health. The cover crop demonstrations and field days continue to be a large part of our efforts because they are a great way to engage agents by requiring them to help plan, plant and manage different cover crops and cover crop mixtures. Agents are expected to take the lead in presenting information, which requires that they learn and are comfortable with the material. Along the same vein, we have built on our work in this area by forming the Cover Crop Extension Team that includes Extension specialists, county agents, and NRCS personnel to take the lead in developing a regional tool for southeast producers in selecting cover crops based on their physiographical region, production system, and business goals. All of the trainings and events that took place this year continue to support our long-term goal to ““Increase use of sustainable agriculture practices by producers at multiple scales supported by a knowledgeable network of agricultural professionals ensuring a high proportion of diverse, profitable, and environmentally-friendly farm operations”. The educational approach for SARE programs strives to use hands-on practical approaches to train trainers on sustainable agriculture practices. We focus on topics identified by our advisory committee through the logic model. We do this by hosting workshops, offering scholarships to conferences, and delivering educational classes regarding sustainable agriculture throughout the state of Georgia. We train county agents in sustainable agriculture through foundation training for new agents, conference scholarships, providing access to SARE books and materials, and support in their county programming. We also publish quarterly sustainable agriculture newsletters, and we manage an e-mail listserv, a Sustainable Agriculture at UGA Facebook page and a Sustainable Agriculture at UGA website – all of which provides a wealth of information to agents and to the public regarding sustainable agriculture production practices, pertinent agriculture regulations, farm business resources, and an up-to-date list of local and regional programs and events happening in sustainable agriculture. Organic production systems were identified by the SARE Advisory Committee as an area where more training was needed for Extension and other agricultural professionals to provide technical assistance to growers. We leveraged SARE funds to support Dr. Ayanava's travel as well as printed materials for this workshop. We created an in-service training for county agents on organic production. The workshop included a morning farm tour to a local successful organic farm. The farm visit included discussions by the farmer on crop rotations through the field and high tunnels. It included discussion with the farmer on crop rotation, crop selection, labor needs, economics of organic farming in a general sense and IPM. After the farm visit, the group met for discussion on good practices observed and areas of improvement. There was a presentation from Dr. Little about organic pest and disease options. Dr. Ayanava from Auburn Extension traveled to give a presentation on Organic IPM and new research in the field of trap crops and timing. Then the participants broke into small groups to discuss a case study and present their recommendations for the problems presented. Thirty-two county agents attended this training and all completed surveys at the end of the workshop. The county agents were asked to rate the content of this training on a scale of 1-5, with 5 being “better than expected” and 1 being “not as good as I expected”, the average response was 3.9. When asked how this workshop changed their knowledge, interest, and confidence in using these skills on a scale of 1-5 with 5 being “greatly improved” and 1=”no change”, the average responses was 3.6 for all three. When we asked how helpful was the meeting, 81% said they plan to make some major changes to their programming or that they might use a few things differently. The most highly rated part of the training was farm tour followed closely by the Organic IPM presentation by Dr. Ayanava. Here are a few of the outcomes and impacts from the county agents. This training took place in May 2017 and we followed up with them in July 2017. Organic production systems were identified by the SARE Advisory Committee as an area where more training was needed for Extension and other agricultural professionals to provide technical assistance to growers. SARE funds were given to Michael Wall, of Georgia Organics, to discuss with ANR agents the process of organic certification. We coordinated a training for Extension agents at a district update that taught agents about organic certification. SARE funds were used to sponsor travel expenses for Michael Wall, Director of Farmer Services with Georgia Organics, who spoke with county agents on the process of grower’s transitioning into organic production, the certification requirements, and resources available to agents and grower’s to verify adherence to the National Organic Program and to maintain their organic certification on an annual basis. The presentation was delivered in September of 2017. Twenty-six county agents attended this training. Agents were sent an e-mail survey in May 2018 to see if the organic certification training has influenced or impacted their programming since September. Agents reported that the information gained from this training was implemented in the following ways: 13 individual consultations resulted from this new knowledge; 28 farmers were assisted from county agents; and 3 new programs were delivered that incorporated this information. Organic production systems were identified by the SARE Advisory Committee as an area where more training was needed to increase the capacity of extension and other agricultural professionals to provide technical assistance to growers. 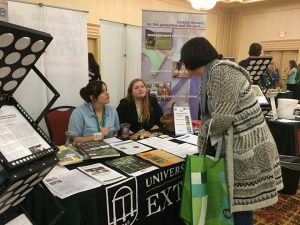 We provided scholarships for agents to attend the Georgia Organics Conference, and we also set up a display booth in the conference Expo. The Georgia Organics Conference is a premier conference for organic producers and small farms. The educational sessions focus on a wide range of our training objectives including, organic production, conservation tillage systems, grazing-based animal production systems, composting, direct marketing, and local foods systems. These sessions increase knowledge and confidence in participating agents, which then increases the likelihood of them working with beginning farmers, organic producers, and resource limited farmers. The 2018 conference featured ten educational tracks that included 40 sessions for growers, livestock producers, farm to institution, and farm & food policy. The conference also includes farm tours to a diverse range of organic farms in the area. We awarded scholarships to three county agents to attend this conference. We did not receive good feedback from agents regarding the Georgia Organics conference educational sessions, and have noted that the feedback from agents for this conference tends to be less positive each year. As a result, we plan to address this with the SARE Advisory Committee this upcoming fall at our next meeting to discuss re-allocating funds to sponsor travel for Extension agents to the Southern Sustainable Agriculture Working Group Conference and the Southeast Fruit and Vegetable Growers Conference. We feel that it is important that SARE funds are being used in the most efficient and beneficial way, so we will be re-evaluating our resource allocation to this particular conference going forward. Local food systems were identified by the SARE Advisory Committee as an area where more training was needed to increase the capacity of Extension and other agricultural professionals to provide technical assistance to growers. We provided scholarships for county agents to the Southern Sustainable Agriculture Working Group (SSAWG) Conference in Chattanooga, Tennessee with SARE funds. The Southern SAWG holds the Practical Tools and Solutions for Sustaining Family Farms Conference, an annual event held in January that provides a forum to learn about sustainable farming techniques and marketing strategies, community food systems, and federal farm policies and programs that promote sustainable agriculture. This event also provides producers, researchers, information providers, concerned consumers and community organizers the opportunity to build networks, strengthen alliances, and celebrate the achievements of Southern sustainable farmers. One county agent and one faculty member received funding to attend the SSAWG Conference. Local food systems were identified by the SARE Advisory Committee as an area where more training was needed to increase the capacity of Extension and other agricultural professionals to provide technical assistance to growers. We provided a travel scholarship to the Georgia Farm to School Summit for one county agent, and SARE funds also allowed us to sponsor a field trip and set up a display booth in the conference Expo. SARE funds also sponsored a field trip for the Farm to School Summit. The field trip was titled “Navigating Farm to School: Road Bumps and Victories for the Famer and School Nutrition”. A display booth was also set up in the summit Expo to provide information on sustainable agriculture, and the resources SARE has available to help folks understand farmer’s markets, soil health, pollinator habitat, and organic production. The Georgia Farm to School Summit had a total of 267 attendees. SARE funds were also used to sponsor one of three field trips. The SARE sponsored field trip was titled: “Navigating Farm to School: Road Bumps and Victories for the Famer and School Nutrition”. 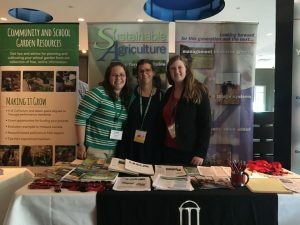 In addition, SARE funds also allowed the Sustainable Agriculture Program at UGA to participate in the Summit as one of six exhibitors at the Expo. With Farm to School efforts growing state- and nationwide, and as more time and research is invested on the impacts of Farm to School, this event was a great opportunity for our program to extend our services and expertise to the public and served to forge stronger relationships with educators, farmers, and organizations within this priority area. Josh Fuder, Cherokee County Extension agent, said “the SARE funds actually allowed me to be present at the training and join a panel discussion with our county school nutrition director and teachers to talk about our county’s model of Farm to School initiatives.” Josh also shared that as a result of this summit, he has been able to use new information to answer 25 client questions, he has developed 5 new contacts/partners for work, he has incorporated new ideas into regular visits with schools and farmers 10 times, he conducted 15 individual consultations, he has reached 45 teachers, and he delivered 3 new programs/events in this area. Programming and activities to promote conservation tillage systems is an activity identified by the SARE Advisory Committee and part of the Model State Program Logic Model. As part of this objective, we have pulled together a team of Extension specialists, county agents, and NRCS personnel to work together on providing the latest, research-based information on cover crop varieties for the southeast. 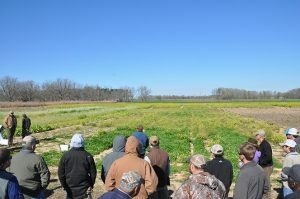 The Cover Crop Extension Team has met twice, once in December 2017 at the Plant Materials Center in Americus, Georgia; and the second meeting was in February 2018 at the Macon Farm Bureau building. Team members met in person and from a distance via Zoom conferencing to help develop pertinent educational material for our production systems in the southeast region that will be incorporated in to an online cover crop selection tool. Three of the team members also help disseminate cover crop information during the Cover Crop Workshops and Field Days. There are 21 active Cover Crop Extension Team members. These are highly productive, five-hour meetings that include a short break for lunch. The next meeting will be held in May 2018 at the Bibb County Extension office. Between both meetings, a total of 16 team members were able to meet in person, while another four members joined us from a distance via Zoom. Members worked through identifying the best cover crop varieties, based on production system, influence on cash crops, price, termination methods, disease resistance, nitrogen fixation, biomass, and a number of other factors important to using cover crops in the southeast. Programming and activities to promote conservation tillage systems is an activity identified by the SARE Advisory Committee and part of the Model State Program Logic Model. As part of this objective three Cover Crop Field Days were sponsored between May 1, 2017 and April 30, 2018 in both the Northeast and Northwest districts. 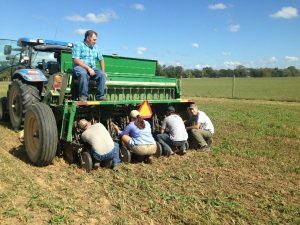 Extension agents and producers attended these field days to learn from Extension specialists and agency professionals about cover crops and equipment necessary for incorporating cover crops into various production systems. Demonstrations are presented to participants regarding selection, seeding rate, plating and termination dates, yields, and functionality of different varieties. Equipment demonstrations are also part of these field days to provide more hands-on learning opportunities. 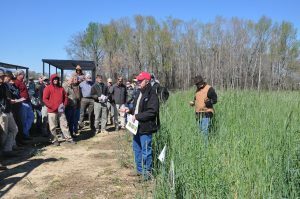 Between the three Cover Crop Field Days, there was a total of 47 participants. The Field Day held at Iron Horse Farm in Watkinsville, GA in March 2018 had 12 participants who submitted evaluations. Of the 12 evaluations, 41% of participants indicated they would definitely make changes to their current practices, and 50% indicating they might try new things as a result of the information they learned. When asked, 50% of participants said their confidence in using skills learned had greatly improved. The Field Day held in Rome, GA in March of 2018 focused on grazing systems, and had 17 participants. A whopping 100% of participants shared that they will definitely make changes to their current production practices, and 25% of participants stated they learned new information regarding calibrating seed drills, and 25% also stated they learned new information regarding calibrating their sprayers. The percentages regarding calibration is significant, because improper seeding rates can be costly and result in inefficient cover crop functions, and improperly calibrated sprayers can have significant impacts on costs with either excessive chemical inputs or insufficient coverage, which can lead to reapplications, both situations resulting in costly inefficiencies. 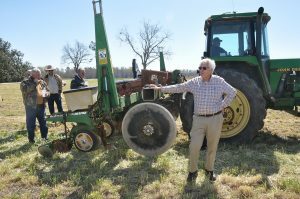 The Field Day in Midville, GA in April of 2018 focused on peanut production, and had 18 participants. When asked, 90% of the participants stated they were already using cover crops as part of their production practices. A significant finding was that even with 90% of participants already using cover crops, 67% of them felt more confident using conservation tillage as part of their production practices, and 83% felt their knowledge in planting methods had increased as a result of attending this field day. This finding is important because it demonstrates how these field days are beneficial to not only the producers new to using cover crops and conservation tillage, but also to those who have already adopted these innovations. Southern SARE Programming and activities were identified by the SARE Advisory Committee and part of the Model State Program Logic Model. 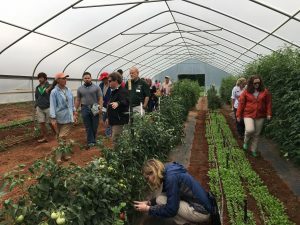 These programs are not only an important function of the Sustainable Agriculture Program at UGA, but Southern SARE Programming serves to maintain a strong presence and relationship among Extension agents, producers and educators in Georgia. This year, the Southeast SARE Program provided funding for travel scholarships for the State Coordinator, Model State Program Assistant, and one Georgia producer to attend the Our Farms Our Future Conference in St. Louis, Missouri. The National SARE conference is a once-in-a-decade event that “brings together the diverse agricultural community including farmers and ranchers, agribusiness stakeholders, students, researchers, scientists, agency representatives and nonprofit leaders. Every decade SARE hosts a conference to look at the progress of sustainability in agriculture and to understand our trajectory for the future.” This year, SARE funds sponsored travel for the State Program Coordinator, Model State Program Assistant, and one Georgia farmer to attend this conference. Southern SARE Programming and activities were identified by the SARE Advisory Committee and part of the Model State Program Logic Model. These programs are not only an important function of the Sustainable Agriculture Program at UGA, but Southern SARE Programming serves to maintain a strong presence and relationship among Extension agents, producers and educators in Georgia. It is vital to our continued programming efforts that the Advisory Committee meets at least once a year to discuss past, current and future events, membership, business matters, and to reassess the short and long-term goals of the Committee. The SARE Advisory Committee held a conference call via Zoom in November, 2017. We welcomed five new members: Chelsea Losh-Jones, Farm Manager at Babe + Sage Farms; Paula Burke, Carroll County ANR Extension Agent and County Extension Coordinator; Dan Glenn, Owner/operator of Deep Grass Graziers; Katie Chatham, Procurement Manager at The Common Market Georgia; and Emily Cabrera, SARE Program Assistant. We also discussed events that took place in the past year to evaluate their potential to be incorporated into the current year’s programming. Six Committee members were able to participate in the conference call on November 6, 2017. New members were welcomed, and potential members were identified as three current members will be rotating off the Advisory Committee in 2018. The Committee discussed successful programs and events from the past year and talked about ways to improve upon them going forward. The Committee decided to scout for better locations to hold future Composting workshops in Atlanta, and have begun conversations with possible locations that are expanding their current compost programs to meet the growing needs in the metro-Atlanta area. The Committee decided that since the past Cover Crop Field Days have had such a great impact in the NE and NW districts, we would aim to host Cover Crop Field Days in the SE and SW districts as well. We also decided that continuing to sponsor travel scholarships to agents for the Georgia Organics and Southern Sustainable Agriculture Working Group Conferences is a great way to build knowledge and networking opportunities among our Extension agents in sustainable agriculture related topics. Southern SARE Programming and activities were identified by the SARE Advisory Committee and part of the Model State Program Logic Model. 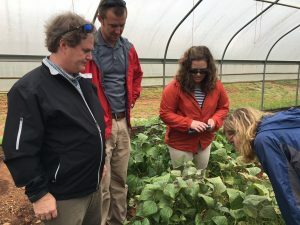 These programs are not only an important function of the Sustainable Agriculture Program at UGA, but Southern SARE Programming serves to maintain a strong presence and relationship among Extension agents, producers and educators in Georgia. A critical piece of our outreach and education efforts is to disseminate the most current, research-based information and resources to our new and beginning Extension agents, in an effort to equip them with the necessary tools to meet the needs of their agricultural producers and county residents. New ANR Extension agents learned about sustainable agriculture production and were given an overview of the many publications and resources available to them from SARE. This presentation was delivered as part of a Foundations Training for new ANR Extension agents in Georgia. There were 24 new agents at the training. Our program assistant delivered the presentation to new agents, which increased their familiarity with sustainable agriculture practices and SARE publications that will help them support their county producers and local businesses and residents. SARE books were distributed to agents and at events to the general public to help educate about sustainable agriculture. SARE books, such as “Managing Cover Crops Profitably”, “Building a Sustainable Business”, “Building Soils for Better Crops”, “Organic Transition”, “Crop Rotation on Organic Farms”, “Managing Insects on Your Farm”, “The New American Farmer”, “The New Farmers’ Market”, “Youth: Renewing the Countryside”, and “Managing Alternative Pollinators” were books that were distributed to county Extension agents during our annual book distribution at Winter School. From May 2017-April 2018, 199 SARE books have been given to new agents around the state. The most popular book requested by agents was “Managing Cover Crops Profitably”, with 48 books distributed, followed by a tie between “Crop Rotation on Organic Farms”, “The New American Farmer”, and “The New Farmers’ Market” with 31 books of each publication distributed. SARE publications were distributed to agents and at events to the general public to help educate about sustainable agriculture. We also distribute various SARE publications throughout the year at the different conferences, trainings, presentations and events that we host and/or attend. The SARE publications are used to distribute information for farmers, gardeners, or general public about sustainable agriculture. From May 1, 2017 through April 30, 2018 we distributed a total of 280 publications were distributed to the general public, growers, and Extension agents throughout the state. At the Georgia Organics conference, we had a booth and distributed 150 SARE publications to conference attendees. We also distributed 57 publications at the Organic Growers School in Asheville, NC. The display booth at the Georgia Farm to School Summit distributed 43 publications. We also distributed 30 publications to participants who attended a sustainable gardening presentation that was given to home gardeners in Blairsville, GA.
7 1) Sustainable Agriculture at UGA Listserv- The listserv is used to distribute news, event/workshop announcements, resources, and other information for farmers, gardeners, or the general public about sustainable agriculture. The listserv has 968 unique recipients as of 4/30/2018, which is up 72 recipients from last year. 2) Sustainable Agriculture at UGA Facebook page- The Facebook page is used to distribute news, event/workshop announcements, resources, and other information for farmers, gardeners, or the general public about sustainable agriculture. Between May 1st 2017 and April 30th 2018 we have increased our Facebook page "likes" from 405 to 533. We made 221 posts, which has resulted in a reach of 22,731 unique users or an average of 103 people per post with the most popular post engaging 1,063 people on growing broccoli and cauliflower under high tunnels. Our posts were also "shared", "liked", "commented" on or "clicked on" a total of 1,077 times. 3) Sustainable Agriculture at UGA Website (SustainAgGA.org)- The website is used to distribute news, event/workshop announcements, resources, and other information for farmers, gardeners, Extension personnel, or the general public about sustainable agriculture. The website underwent major changes as it was transitioned from an older platform in Adobe Contribute to a newer and more efficient and attractive platform in Adobe Experience Manager. Between May 1st, 2017 and April 30th, 2018 the SustainAgGA.org website has received 11,392 unique visitors, with 30,562 page views. This is 344 more unique visitors than we had last year. 4) Sustainable Agriculture at UGA Newsletter- The Sustainable Agriculture Newsletter is our quarterly newsletter that has information for farmers, gardeners, Extension personnel, and others interested in sustainable agriculture in Georgia. Please see attached newsletters. This goes out to the 968 people on the listserv and is distributed at conferences and workshops. Three newsletters were published and distributed between May 1, 2017 and April 30, 2018. 5) UGA Sustainable Food Systems Initiative events- In the past, hosting quarterly seminars has been the main programmatic event for the Sustainable Food Systems Initiative; however, in order to maintain our presence on campus and to provide the most fresh and cutting edge research and information to faculty and students, the Sustainable Food Systems Initiative Executive Committee decided in November 2017 to shift their focus to different methods of outreach. The Committee decided that in addition to delivering seminars, our efforts would also focus on hosting additional events, such as film screenings that would incorporate panel discussions, and events that would draw more attention and multi-disciplinary involvement across campus. One seminar was delivered on 11/15/2017, titled “Is Farm to School a Realistic Strategy for Promoting Local Food Systems?” which attracted 25 participants that included students, faculty and staff, and county Extension agents. The SARE program assistant helped put this seminar together and promote the event across campus and through social media. A film screening is scheduled for Fall 2018 for the film “Food Evolution”, for which a panel of three faculty members will lead a discussion after the film to have a balanced conversation regarding the benefits and setbacks of GMO foods and their environmental implications. The SARE Program Assistant helps coordinate these events. 6) Greater Atlanta Regional Center of Expertise Meeting at UGA- The Sustainable Food Systems Initiative also became involved in a multi-organizational group that is comprised of all the higher educational institutions from Atlanta, and several NGO’s and businesses from around metro-Atlanta, who are all working collaboratively in an effort to address the United Nations Sustainable Development Goals. The SARE Program Assistant organized a meeting that was held on February 27th at UGA, which drew a total of 23 attendees, consisting of faculty, staff and students from various educational institutions, including minority higher education institutions, several NGO’s and businesses, and also had 9 attendees that joined us from a distance via Zoom. The meeting was also open to the public to help draw more involvement from students and faculty from UGA. 7) Georgia Fruit and Vegetable Growers Association Meeting- Julia Gaskin organized the organic track of speakers at this conference, which took place January 11 - 14, 2018 at the Savannah International Trade and Convention Center in Savannah, GA. Julia identified four speakers for the organic track of the conference. 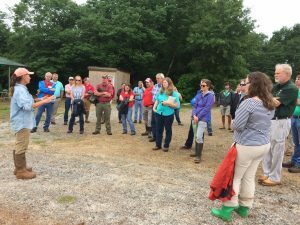 The Georgia SARE Model State Program increased participation in sustainable agriculture programming from May 1, 2017 through April 30, 2018, as evidenced by the increase in attendance at events, the increase in collaborative events, and more name recognition for SARE. We continued conducting stand-alone workshops to address specific areas of our Logic Model that included supporting an Organic Production training for county Extension agents. Other Model State efforts include collaborative events like organizing the organic conference at Georgia Fruit and Vegetable Growers’ annual conference, providing scholarships for several sustainable agriculture related conferences, and continued populating/updating of the sustainable agriculture website and Facebook page. Additionally, we publish a quarterly newsletters which are distributed through our listserv. We have displayed information on SARE at several events and at applicable trainings and workshops around the state such as the Georgia Organics Conference and the Georgia Farm to School Summit . By organizing and displaying at a variety of different events, we are able to reach a wider and more diverse audience.